All five books in the blockbuster Percy Jackson and the Olympians series, in paperback, have been collected in a boxed set fit for demigods. Now with glorious new cover art and packaged with a special poster, this value-priced set includes the best-selling The Lightning Thief, The Sea of Monsters, The Titan's Curse, The Battle of the Labyrinth, and The Last Olympian. 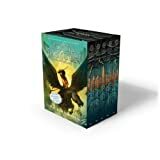 Whether it is for readers who are experiencing Percy's thrilling adventures with Greek gods and monsters for the first time, or for fans who want to devour the saga again, this gift will be prized by young and old.